If you are using one of the Home Signal Distribution Kits, follow the kit-specific additional installation instructions included with the kit. Choose a mounting location for the antenna that has the best possibility of receiving the signal from the SiriusXM satellite in the south sky. There should be no obstructions such as bushes, trees, other homes or buildings, overhangs, soffits, chimneys, gables, dormers, etc, blocking the antenna's view of the south sky. An ideal mounting location would be one which has a clear view of the sky in all directions (A). If that is not possible, then you'll need a location with a clear view of the south sky (B). If you look closely at illustration B, you can see that the antenna does not have a clear view of the sky in all directions due to trees. However, it does have a clear view of the sky toward the south, in the direction of the satellite. Your antenna will also need to have a clear view of the sky in the south direction. Not sure which way is south? Think about where the sun rises (in the east) and sets (in the west). Then stand so that east is to your left and you'll be facing south. Mount the Outdoor Home Antenna on a wall, or on the roof of the house, or on a pole or satellite dish mast. 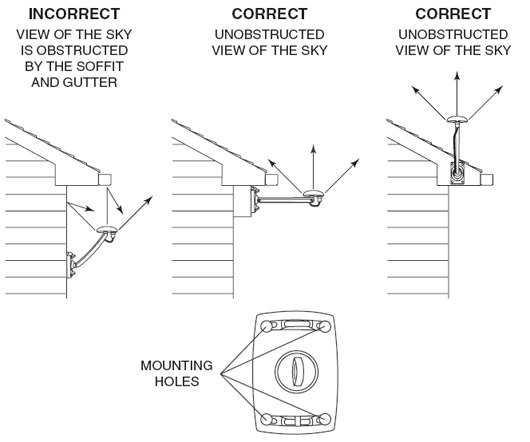 Roof Mounting: Use the provided screws to mount the base of the antenna to your home's roof (on a soffit). Note: When mounting the Outdoor Home Antenna to a satellite TV antenna mast be sure that the satellite TV antenna does not obstruct the Outdoor Home Antenna's view of the south sky. Once you have determined a possible mounting location for the antenna, before permanently installing it at that place, you need to test whether you are receiving a good signal. Keeping the antenna orientation as intended, you will first temporarily install the provided cable between the antenna and your Radio or Home Dock. Connect the included antenna cable to the antenna pod and slide the rubber boot over the connection to weatherproof it. Note: The cable included with the antenna has two different connectors. The larger connector fits the connector on the antenna while the smaller connector fits your Radio or Home Dock. Route the antenna cable to your Radio or Home Dock and connect it to the ANT connection on the Radio or dock. Continue with Step 4. 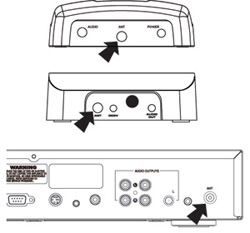 Note: Please review and follow the installation instructions included with the Home Signal Distribution Kit you purchased before connecting it to your Radio or Home Dock. The instructions will contain information about the RG-6 cables you may need to purchase to complete the installation. Once you have determined a possible mounting location for the antenna, before permanently installing it at that place, you need to test whether you are receiving a good signal. 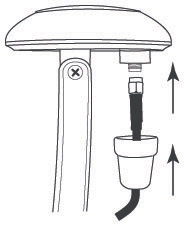 Keeping the antenna orientation as intended, you will first temporarily install a short length of RG-6 cable (less than 50 feet long) between the antenna and your Radio or Home Dock. Using one of the RG-6 cables that you purchased, one which is less than 50 feet long, connect the cable to the antenna pod and slide the rubber boot over the connection to weatherproof it. Route the cable to your Radio or Home Dock and connect it to the Adapter Cable. Connect the Adapter Cable to the ANT connection on your Radio or Home Dock. 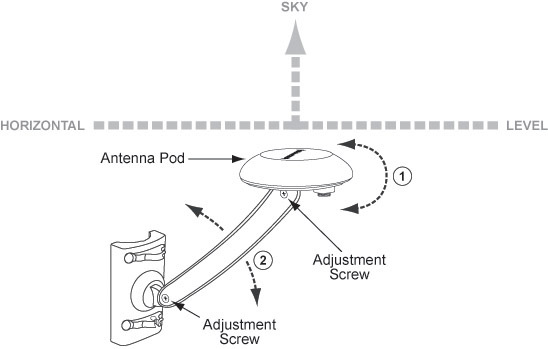 Note: If reception is weak, review the mounting location to be sure that the antenna pod has an unobstructed view of the south sky, and review the position of the antenna pod to be sure that it is horizontal relative to the sky. 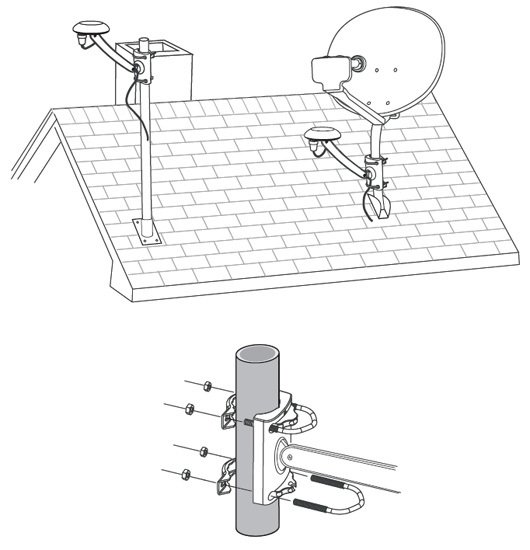 Once you have verified that the antenna is positioned correctly and receiving a good signal, follow the installation instructions which accompanied the Home Signal Distribution Kit to complete the installation. Otherwise, the installation is complete. Signal Distribution Kits: SiriusXM offers several solutions which use standard RG-6 cable used for cable TV and satellite TV systems. RG-6 cable is standard off-the-shelf cable and can be purchased in varying lengths from local hardware, home center, or electronics retailers. Professional installers also carry RG-6 cable in bulk. SiriusXM also has kits which utilize existing RG-6 cables in your home (cable TV or satellite TV). All kits include an Outdoor Home Antenna. Home Signal Distribution Kit for Satellite Radio: This kit lets you to connect up to two SiriusXM Radios to an Outdoor Home Antenna up to 150 feet away using RG-6 cables. The kit includes the Outdoor Home Antenna and other components needed to carry the signal to each Radio. The RG-6 cables need to be purchased separately. Professional installation of this kit is recommended. Home Signal Distribution for Cable TV plus SiriusXM: This kit lets you connect your SiriusXM Radio to an Outdoor Home Antenna up to 150 feet away using existing cable TV wiring in your home. It sends the SiriusXM signal to any room in your home where there is a cable TV outlet. The kit includes the Outdoor Home Antenna and other components necessary to combine the cable TV signal and the SiriusXM signal together on your existing wiring, and to split the signals at the appropriate location within the home. Some additional lengths of RG-6 cables are required and need to be purchased separately. Professional installation of this kit is recommended.